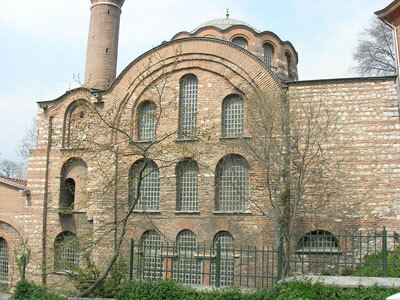 Kalenderhane Mosque is a former Eastern Orthodox Church converted into a mosque by the Ottomans. With high probability the church was originally dedicated to the Theotokos Kyriotissa. This building represents one among the few still extant examples of byzantine church with domed Greek cross plan. The mosque is located at the western end of the existing section of the Aqueduct of Valens (Bozdogan Kemeri), offset slightly to the south of the aqueduct. The field study by Kuban and Striker has also revealed that the existing church was built during the late Comnenian Dynasty (1081-1185) incorporating remains of earlier structures built on the site, including a 4th or 5th century private bath, two basilicas predating the iconoclastic period (717-867) and an unfinished 8th century church. A mosaic panel depicting "the Presentation of Christ", uncovered on the apsidal wall of one of the basilicas, is the only remaining wall mosaic panel from pre-Iconoclast-era Constantinople. Frescoes found in a diaconicon chapel describing the life of St. Francesco, the oldest surviving depictions of the saint, suggest that the church was used by Catholics during the Latin invasion. The church was surrounded by monastery buildings before the Ottoman conquest, none of which survived through the Ottoman period. Used as a zawiya (zaviye) after the conquest, the church was converted into a mosque by Maktul Besir Aga, the chief officer of the Ottoman Palace in the 18th century. The Turkish name of the church is thought to refer to the Kalenderi sect, to whom the zawiya was probably bequested after the conquest. The reconstruction of the church during the conversion was probably a necessary response to damage in fire and earthquake in early 18th century. The mosque was poorly repaired in 1854, following a fire. It was finally abandoned after its minaret collapsed in the 1930s. The restoration by Kuban and Striker, mentioned above, has restored the original features of the Comnenian church, the 18th century mihrab and the minaret for the continued use of the monument as a mosque. The church has a Greek cross or cross-domed plan, preceded by an inner and outer narthex to the west, and with sanctuary to the east. The side entrances from the inner narthex were closed in the period following the Latin invasion. There was also an upper gallery to the inner narthex, which was possibly removed during the 1854 reconstruction, and windows were opened on the northern façade inside the grand arch that was previously obscured by the gallery. The aisles flanking the nave to the north and south are also thought to have been removed at this time and neither was rebuilt during the 1966 restoration; the triple arches that used to link the nave to the aisles now form the lower tier of windows on the north and south façades. The sanctuary, which was probably replaced by a straight wall with a mihrab during the 18th century conversion, was rebuilt during the restoration and the restored mihrab was moved into the sanctuary apse. The foundations of the sanctuary, which guided the reconstruction, contained the footprint of a smaller mihrab built earlier for the zawiya. The chapels of prothesis and the diaconicon, located to the north and south of the sanctuary, are complex in plan and incorporate fragments of chapels and apses from earlier structures. Two elaborate icon frames, located on the piers flanking the sanctuary, provide information about the non-extant iconostasis, which rose to the level of the vaults. The original decoration of the church has been largely maintained and consists of polychrome marble revetments and moldings. Photographs of the mosque prior to 1966 show a white plastered exterior transformed severely by the 1854 reconstruction. The rounded profile of the roof, created by the barrel vaults enclosing the nave, was filled in to form pitched roofs on all sides and the roof of the narthexes was rebuilt and covered with tiles. The entry arch to the outer narthex, which sunk below grade in time, was torn down to make a new entrance; it was restored to its original form in 1966. The minaret, which was also rebuilt during the 1966 restoration, rises from the southwest corner of the church. The frescoes of St. Francesco and the mosaic panel depicting "the Presentation of Christ", which were discovered in the archaeological expedition preceding the restoration, have been partially restored and are displayed in the Archaeological Museum of Istanbul. Other findings from the 1966 expedition are displayed in a small museum located in the diaconicon of the Kalenderhane Mosque.